Page revised in August 2016. Links to this page can be found in Book 3, Day 5 and View C11. Antonio Nibby (1792-1839) was an Italian archaeologist who updated the guides to Rome written by Giuseppe Vasi and his son Mariano; in 1825 he discovered three inscriptions in a large circus near the tomb of Cecilia Metella; they all made reference to Maxentius, but one in particular stated that the circus was completed in 311 AD and that it was dedicated to Romulus, the son of Maxentius who died in 309 in his teens. Until the discovery of the inscription the circus was named after Emperor Caracalla owing to a statue of him found in the vicinity. An obelisk erected by Emperor Domitian near Iseo Campense was removed by Maxentius and placed on the spina (the raised strip in the middle of the circus); the obelisk returned to Rome in ca 1650 when Gian Lorenzo Bernini used it for Fontana dei Quattro Fiumi in Piazza Navona. 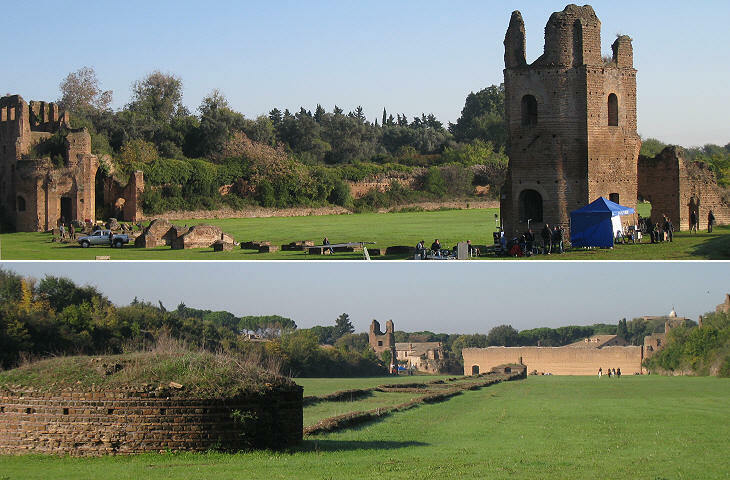 The circus was built next to a large villa (almost an imperial palace) where Maxentius erected a mausoleum for his son. Because in 312 he was defeated by Emperor Constantine at the Battle of Ponte Milvio, it is thought that the circus was actually used only for the inauguration ceremonies. Maxentius was acclaimed emperor in Rome in 306; he ruled only over Italy and parts of northern Africa; he had no military experience and he relied on his personal wealth to buy out the troops of his enemies; he also made use of his money to retain popularity in Rome by promoting the construction of many buildings: the villa and the circus were part of this policy. The eastern end of the circus built by Maxentius borders on a valley which today is known as Valle della Caffarella (a reference to Cardinal Scipione Borghese Caffarelli who owned it). At the time of Ancient Rome it was known as the valley of River Almo, a small stream which joined the Tiber south of Testaccio and also as the valley of Egeria, a nymph. The most elevated points of the valley offer views which are unspoiled by modern buildings, but few foreigners visit it. Access from Via Appia Antica is not very easy to find: a winding alley, which begins at Cappella di Reginald Pole and is flanked by high walls protecting the privacy of secluded villas, leads to this area which was opened to the public in the 1990s. 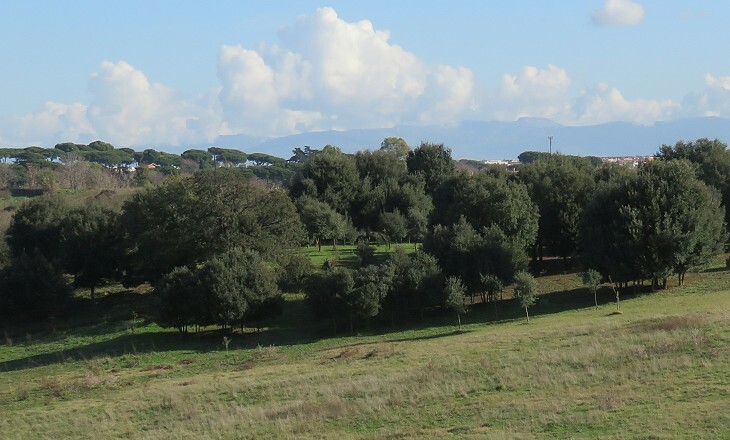 Valle della Caffarella is by no means an Italian garden and because parts of it are still farmed or used for pasture, in some areas it has a rather forlorn aspect which recalls description of the Roman Campagna by travellers of the past. Of all kinds of country that could, by possibility, lie outside the gates of Rome, this is the aptest and fittest burial-ground for the Dead City. So sad, so quiet, so sullen; so secret in its covering up of great masses of ruin and hiding them. Torre Valca is the current name of a medieval tower built by the Caetani to protect their fortress at Cecilia Metella. The building is located by the river and it was called Valca after gualchiera (fulling-mill), a process of the textile industry for which it was used at a later period. 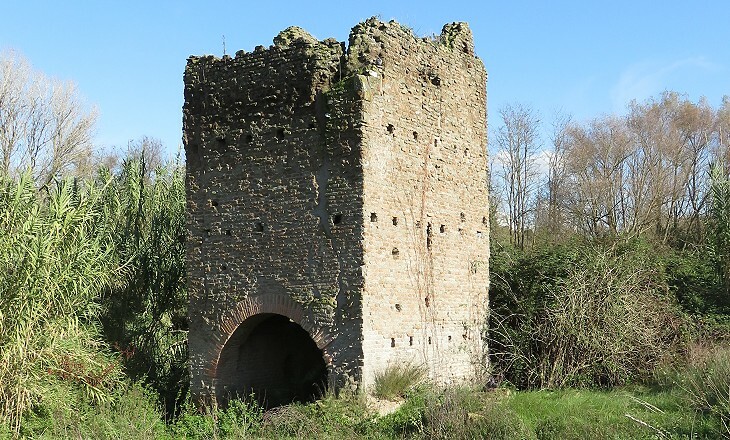 colombario means dovecot, but archaeologists use this word to indicate an ancient tomb which has small niches for cinerary urns. The brick tomb named after Emperor Constantine was actually built in the IInd century AD. 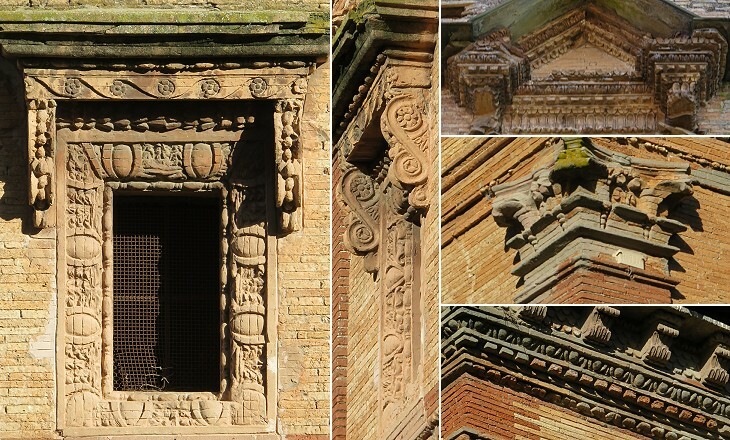 You may wish to walk your "virtual" dog at Valle della Caffarella and see more images of some of the ancient buildings shown in this page. Herodes Atticus was a Greek rhetor who was highly regarded by Emperors Hadrian and Antoninus Pius to the point that he was entrusted with the education of future Emperors Marcus Aurelius and Lucius Verus. He was a very wealthy man and he became wealthier by marrying Annia Regilla, a member of an ancient and rich Roman family; her dowry included Pagus Triopius, a large estate in Valle della Caffarella and also some land along Via Appia; pagus in Latin means village/country district, while Triopius is a reference to Ceres, the goddess of farming. Herodes and his wife lived in a villa inside Pagus Triopius, but most often in Greece. In 160 Herodes was accused by his brother-in-law of having arranged the killing of Annia Regilla, but at the end of a trial he was acquitted. He then followed the steps of Emperor Antoninus Pius (a widower who dedicated several monuments to his wife Annia Faustina) and he built the Odeon of Athens in honour of Annia Regilla (but it is usually named after him). Annia Regilla was buried in a small mausoleum near the River Almo in Valle della Caffarella, most likely a location she loved. 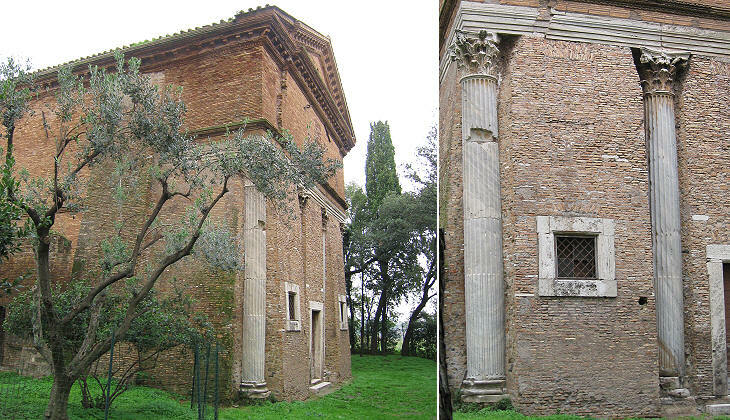 During the XIXth century the building was thought to be a temple to Rediculus, the Roman god who protected the safe return of travellers (Rediculus from Latin redire, to return). Herodes Atticus built also a temple in honour of his wife but he dedicated it to Ceres and to Annia Faustina; the temple was built with the same technique used for Sepolcro di Annia Regilla. 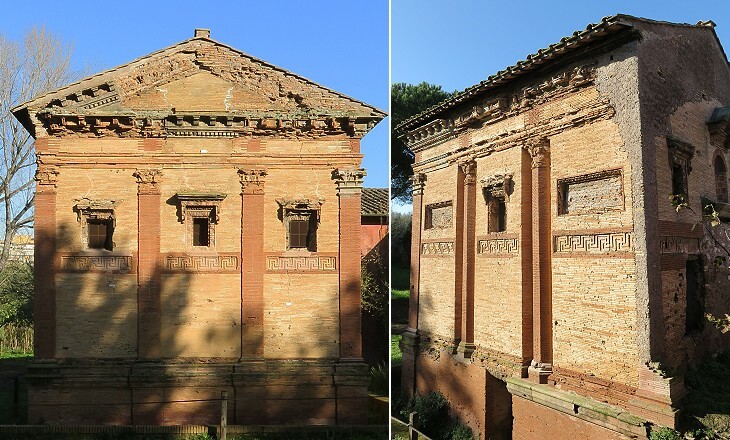 In 1634 the building was at risk of collapsing and Pope Urban VIII restored it and strengthened its structure by closing its pronaos (porch). The church was dedicated to St. Urban, not because of the Pope's name, but because it was thought that St. Urban, who was pope between 222 and 230, had used the building as a church. Catacombs are usually associated with the Christian use of them, but these underground galleries were common in Rome. Catacomba di Pretestato, which was called after a name found on an inscription, began to be used as a burial ground in the early IIIrd century AD and only at a later time it became a Christian cemetery. The sarcophagus shown above is dated ca 370-380. It was decorated with scenes which can be seen on many other Christian sarcophagi, but the three good shepherds (see a sarcophagus at Porto) and the winged genii (or Cupids) working in a vineyard (see a fresco in Roman houses near SS. 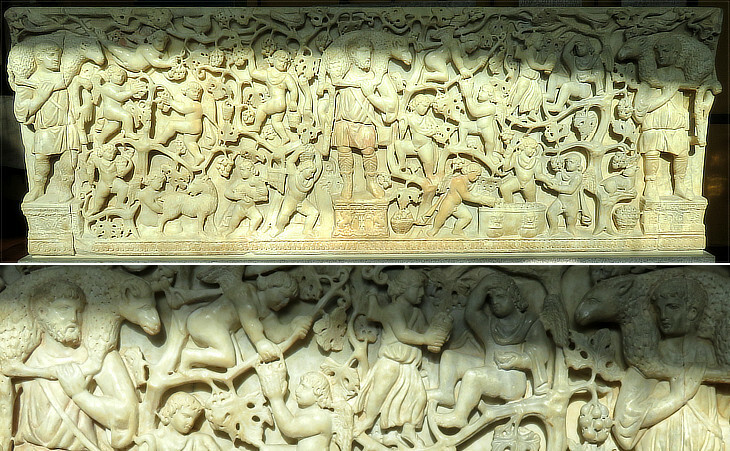 Giovanni e Paolo) appeared already in earlier non-Christian sarcophagi and paintings. Valle della Caffarella was for many centuries associated with Numa Pompilius, the second king of Rome. 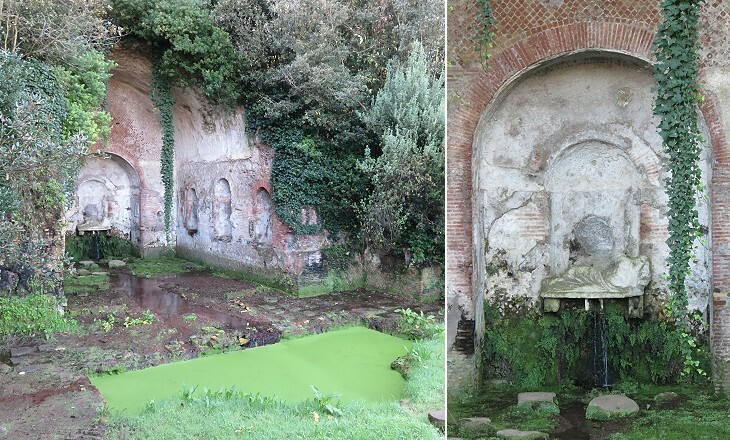 The sacred wood and the grotto where he used to meet with Nymph Egeria, his patroness and adviser were located near S. Urbano, but according to Titus Livius, Numa and Egeria met at Valle delle Camene. The grotto is actually an artificial cave, once adorned with statues and used as a summer resort for the large suburban villa of Herodes Atticus and then included into that of Maxentius. 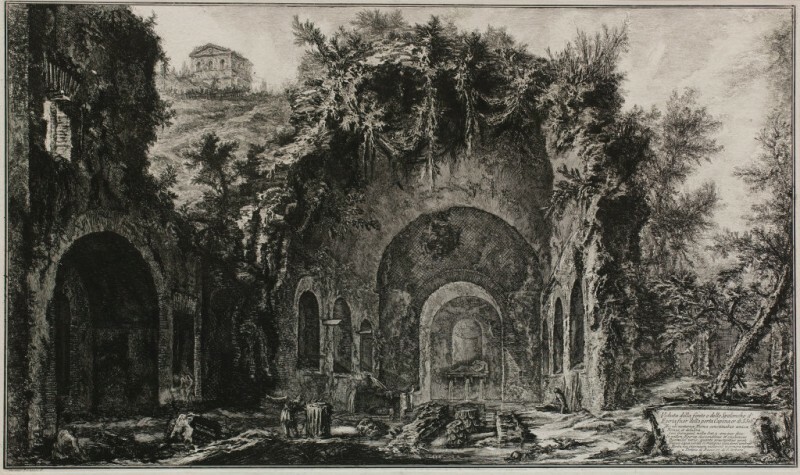 In the XVIIIth century a visit to the grotto was a must for the educated traveller: Goethe himself sketched it and Giovanni Battista Piranesi depicted it in a well known etching (it opens in another window). You may wish to read Lord Byron's verses dedicated to this site. From S. Sebastiano the most pious pilgrims could expand their Visita delle Sette Chiese by reaching S. Paolo alle Tre Fontane and (after 1744) Santuario del Divino Amore. On their way pilgrims rested at SS. 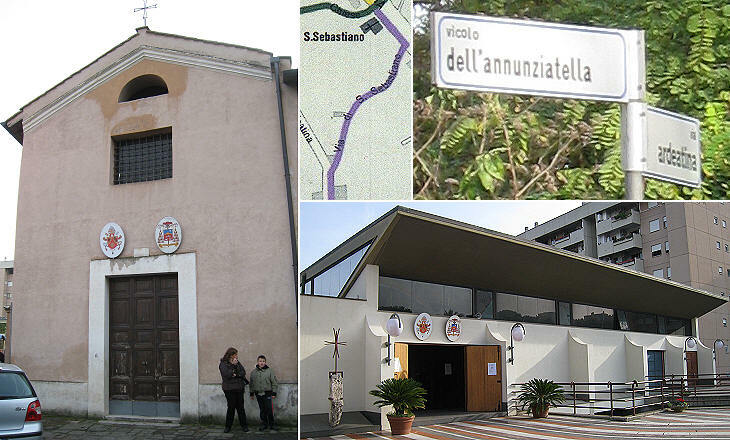 Annunziata; because the building was small the church was called Annunziatella. In the 1765 Grand View of Rome by Giuseppe Vasi it can be seen at B12, number 228. At that time the neighbourhood was almost unpopulated; today while the streets leading to the church (Via di S. Sebastiano, Via Ardeatina and Vicolo dell'Annunziatella) are included in an area where new buildings are forbidden, SS. Annunziata itself is outside this area and is surrounded by a new development: for this reason a new larger church was built behind the old one. 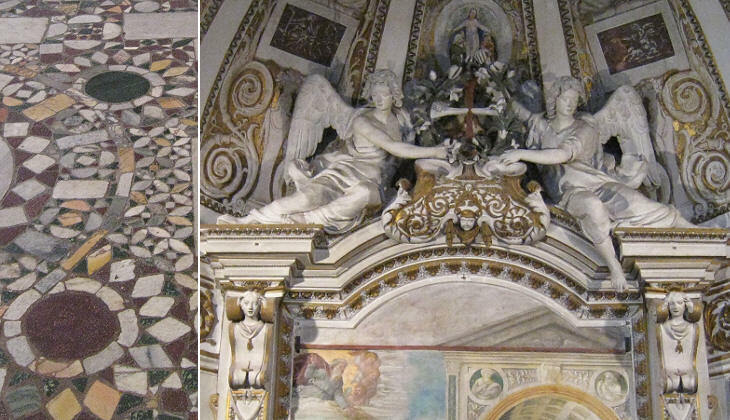 The original church is very old: it was renovated in the XIIIth century (the floor belongs to that period) and later on by Pope Urban VIII (decoration of the apse). 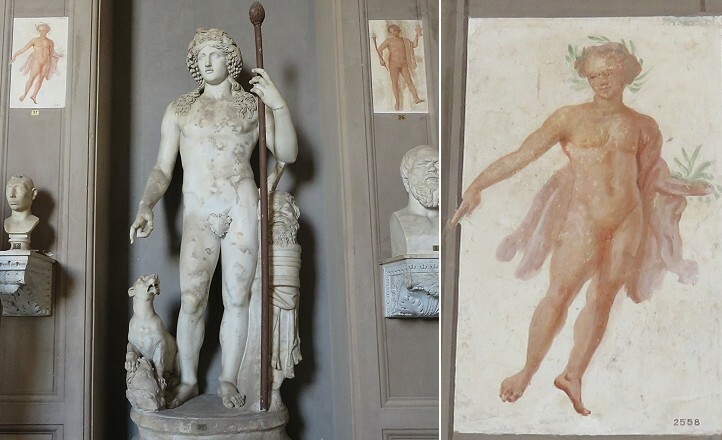 The excavations which led to finding a beautiful statue of Dionysus near Via Ardeatina were carried out in 1817-823. Two Roman villas were found which were named after Numisia and Munazia Procula whose names were found on lead water conduits. The exhibits at Musei Vaticani are dated IInd century AD. Next plate in Book 3: Basilica di S. Maria in Trastevere. Next step in Day 5 itinerary: Chiesa di S. Paolo alle Tre Fontane. 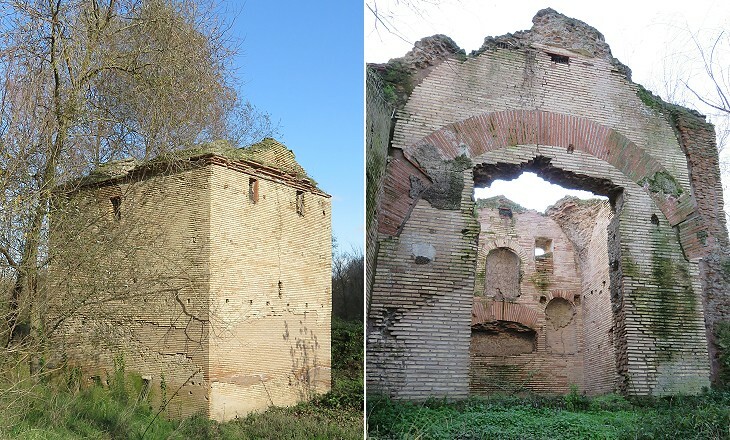 Fra le molte rovine, che si vedono in queste campagne, sono notabili quelle di un tempio creduto di Bacco, posto in un sito alto nella tenuta della Caffarella, che sino al Pontificato di Urb. VIII. stette coperto di spine, e siepi. E' questo fatto di mattoni, ed ha un portico con colonne marmoree scannellate: di sotto poi vi è l'oratorio ove s. Urbano catechizzava, e battezzava i nuovi fedeli. 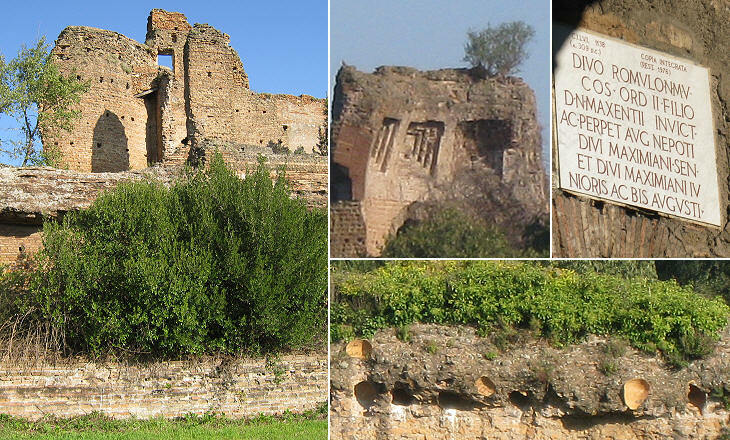 Nel basso di questo colle si crede essere stata la celebre Fonte di Egeria e delle Camene. Appresso al fonte era il bosco, e la spelonca, in cui Numa soleva segretamente trattenersi per dare a credere d'aver notturni congressi con quella Dea, e però i Sacerdoti vi andavano per sagrificarvi alla Fede. 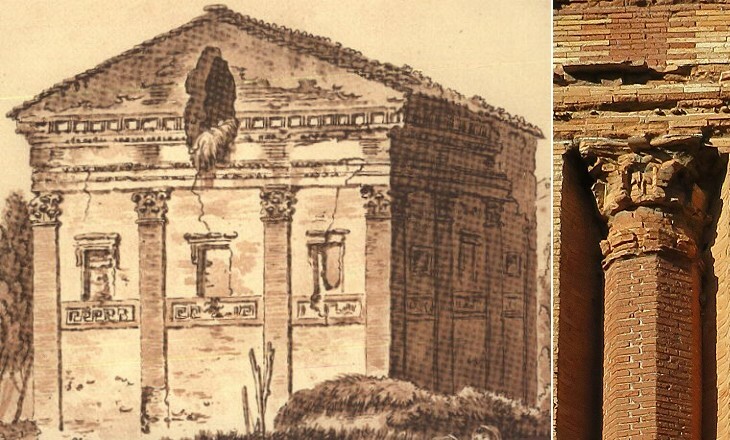 Non molto discosto siede questa chiesa, presso cui ne' primi tempi del cristianesimo fu eretto un ospizio per li poveri pellegrini, che venivano in Roma a visitare i sagri Limini, acciocchè stessero lontani da' Gentili. Nell'an. 1270. essendo rinnovata, e consagrata la chiesa, fu poi conceduta alla Compagnia del Confalone. Quindi camminando per quelle campane inzuppate del sangue di tanti ss. Martiri, cioè di quei Cristiani, che lavorarono nelle terme Diocleziane, i quali in ricompensa, e per odio della santa Fede furono fatti morire, detto perciò da varj Scrittori Campus trucidatorum.